In Intelligent Bio-Systems, Inc., v, Illumina Cambridge Ltd., [2015-1693] (May 9, 2016), the Federal Circuit affirmed the PTAB’s Final Written decision that the challenged claims of U.S. Patent No. 7,566,537, directed to a method of labeling nucleotides in DNA strand, was not shown to be obvious. The presence or absence of a motivation to combine references in an obviousness determination and the presence or absence of a reasonable expectation of success are questions of fact reviewed for substantial evidence. With respect the the expectation of success, the Federal Circuit found that the Board got it wrong, by failing to consider the appropriate scope of the claim. The Federal Circuit noted that the Board seemed to believe that the “reasonable expectation of success” inquiry looked to whether one would reasonably expect the prior art references to operate as those references intended once combined. The Court said that is not the correct inquiry—one must have motivation to combine accompanied by a reasonable expectation of achieving what is claimed in the patent-at-issue. While the Board conflated two different legal concepts—reasonable expectation of success and motivation to combine—it nevertheless made sufficient factual findings to support its judgment that the claims at issue are not invalid. Petitioner had the burden to show that a skilled artisan would have been motivated to combine the teachings of the prior art references to achieve the claimed invention. However petitioner’s argument for obviousness was that it would have been obvious to combine the references to in order to improve the efficiency, reliability, and robustness of the sequencing by synthesis method taught in the primary reference, which required quantitative deblocking. So even though quantitative deblocking was not a requirement of the claims, it was a requirement of Petitioner’ stated reason for the combination, and the “central” to a motivation to combine. Not only did the Petition fail to provide a specific or credible explanation why an ordinary artisan would have combined the references, the patent owner provided substantial evidence to support a finding that a person of ordinary skill would not have had reason to combine the references. These references support a conclusion that the claimed efficiency that allegedly motivated the combination would not be achieved and that a person of ordinary skill in this field would not have been motivated to combine the references. Of more significance, is the Federal Circuit’s treatment of Petitioner’s improper reply brief. The Federal Circuit noted that the Board’s determinations whether petitioner exceeded the scope of a proper reply in violation of 37 C.F.R. § 42.23(b) and/or improperly incorporated arguments by reference from another document in violation of 37 C.F.R. § 42.6(a)(3) are reviewed for an abuse of discretion. The Federal Circuit observed that unlike district court litigation—where parties have greater freedom to revise and develop their arguments over time and in response to newly discovered material—the expedited nature of IPRs bring with it an obligation for petitioners to make their case in their petition to institute. The Federal Circuit agreed that new grounds were presented in Petitioner’s reply, and that the Board did not err in refusing the reply brief as improper under 37 C.F.R. § 42.23(b). Having concluded the Reply was improper, the Federal Circuit did not reach the issues of whether the reply also impermissably incorporated arguments by reference. In Pride Mobility Products Corporation v, Permobil, Inc., [2015-1585, -1586] (April 5, 2016), the Federal Circuit reversed the PTAB’s construction and cancellation of claim 7, but affirmed cancellation of all the other claims of U.S. Patent Nos. 8,408,598 and 8,408,343 in IPR2013-00407 and IPR2013-00411. The claim language says two things about the plate: it must be substantially planar, and it must be oriented perpendicular to the drive-wheel axis. The “oriented” term allows the plate and axis not to be touching: it requires that their placement in space must be such that, if translated in space without rotation, they would be perpendicular. With the axis idealized as a line, perpendicularity in the ordinary geometric sense relevant here requires that the axis make a right angle with either an essentially one-dimensional feature (a line or curve) or an essentially two-dimensional feature (a plane or surface) of the plate: lines are not “perpendicular” to a three dimensional object in any other ordinary geometric sense. And the claim tells us exactly what that feature of the three-dimensional plate is: it is the surface that makes the plate substantially planar. The claim identifies no other feature of the plate. The phrase “oriented perpendicular to the drive wheel axis” must be read to mean that the drive-wheel axis is perpendicular to the mounting plate’s substantially planar surface. We do not see how the claim language can mean anything else without obvious strain. not reasonably support a departure from what the claim language and specification so clearly mean. There was no evidence of the claim 7 element in the relied-on prior art. Because there is no other Board ruling or properly preserved argument addressed to this element, the Federal Circuit reversed the cancellation of claim 7. In HP Inc., v. MPHJ Technology Investments, LLC, [2015-1427] (April 5, 2016) the Federal Circuit affirmed the PTAB Final Written Decision in IPR2013-00309, agreeing that all but one challenged claim (claim 13) of U.S. Patent 6,771,381 was anticipated, and holding that it cannot review the Board’s decision not to review that claim as obvious, on redundancy grounds. by the Director whether to institute an inter partes review shall be final and nonappealable. 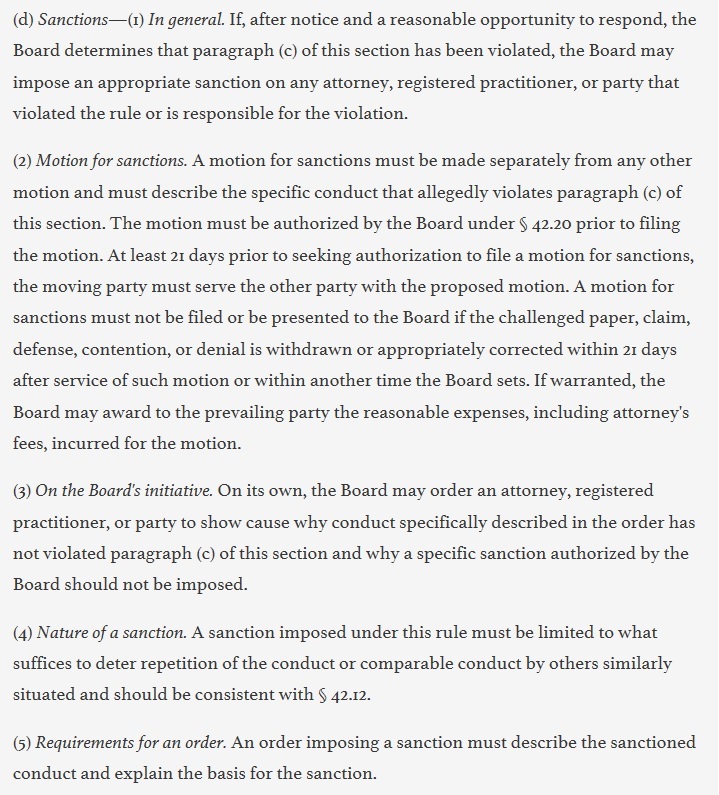 The Board rejected HP’s arguments, including that 314(d) only barred review of findings under 314, namely where there is a reasonable likelihood that petitioner would prevail; that § 314(d) does not bar review of whether the Board has properly construed the scope of its authority; that the Board lacks authority to grant review on only a subset of properly presented grounds; that the Board did not fulfill its obligations under the APA; and finally that the Board did not adequately explain redundancy.